Leading business executives, entrepreneurs, thought leaders and government officials gathered yesterday, March 8th, at The Ritz-Carlton Abu Dhabi - Grand Canal, for the 2015 AmCham Middle East and North Africa (MENA) Regional Council Conference. The AmCham MENA Regional Council represents nine AmChams: Abu Dhabi, U.A.E. ; Algeria; Bahrain; Egypt; Jordan; Lebanon; Morocco; Palestine and Tunisia. This year, the event hosted by AmCham Abu Dhabi, AmCham MENA Council Chair, provided a platform to strengthen business ties between MENA region markets and the U.S. and is an annual highlight of the MENA business calendar. The conference discussed the promotion of trade and investment between the United States and the Middle East North Africa region; advancing corporation between these countries and the U.S. - Fostering increased collaboration amongst members, as well as institutionalizing their ongoing coordination with the U.S. Chamber of Commerce. It featured as speakers: Senior Officials from regional Trade and Investment Ministries, Senior U.S. Government Officials from the region, Presidents and Chairs of MENA region AmChams, heads of multinationals, angel investor networks, venture capital and private equity institutions. Top corporate sponsors of the event were: Abu Dhabi Convention Bureau, Abu Dhabi Tourism & Culture Authority, Cleveland Clinic Abu Dhabi, Etihad Airways, General Electric, MetLife, Middle East General Enterprise, PepsiCo, Sultan International Holding, The Coca-Cola Company and The International New York Times. 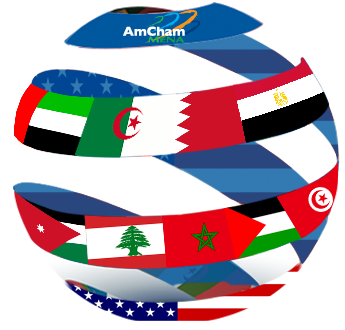 The AmCham MENA Regional Council (MENA Council): was established in 2005, and comprises the AmChams of Abu Dhabi - UAE, Algeria, Bahrain, Egypt, Jordan, Lebanon, Morocco, Palestine and Tunisia. The objective of the Council is to foster increased collaboration and cooperation amongst the members, and to work on promoting greater business opportunities between the United States and the Middle East North Africa Region. The Council works on effectively linking the various members, and institutionalizing their ongoing coordination with the U.S. Chamber of Commerce. It also works on promoting Free trade agreements (FTAs) between MENA countries and the U.S., and on fostering increased awareness among MENA region manufacturers and producers of export opportunities to the U.S. through those agreements. AmCham Abu Dhabi is the current Chair of the Council, and AmCham Bahrain is the Vice Chair.